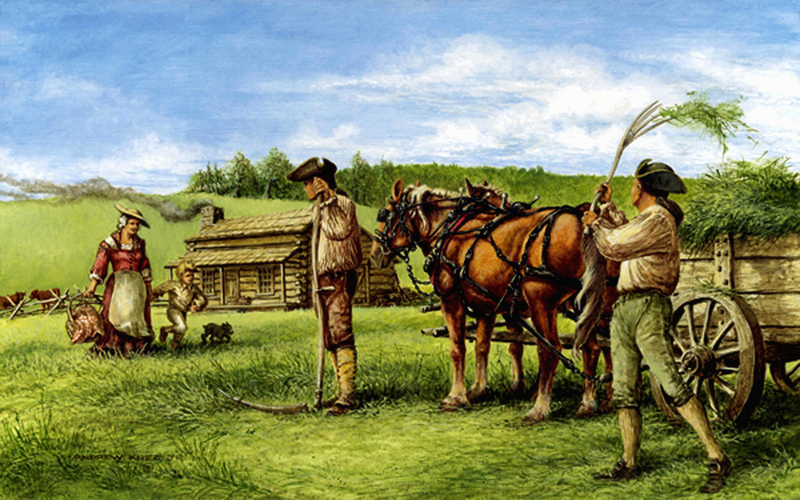 The migration of pioneers pushing west into the vast forests west of the Allegheny Mountains began as a trickle early in the 1700’s. The first to venture into the area were traders and military personnel, however, the hunting pioneers quickly followed. The flood of white settlers increased dramatically as the Indians were pushed further and further west, either by force or treaty. The hunting pioneer families were extremely self-reliant and solitary. The bulk of their worldly possessions were a horse, a cow, a few pigs and a good rifle. They built crude log cabins, cleared a small area to grow some corn, squash and beans and relied upon the animals of the forest for most of their food, clothing and trading needs. The hunting pioneers moved further west as game became scarce and farming pioneers moved into the area. The farming pioneers obtained legal title to the land and cleared it to raise crops and have pastures for their livestock. They were somewhat more affluent and built structurally sound, permanent, hewn log homes. Photos taken in 1923 of a surviving farming pioneers’ homestead and property were used as a basis for this late summer scene depicting a family at work. The farming pioneer family of Richard Boyce settled along Chartiers Creek in 1774 near the present day border of Allegheny and Washington Counties in Pennsylvania. The original log house survived nearly two hundred years, until the 1960’s when it was abandoned, fell into disrepair and was eventually razed.